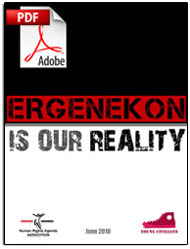 “Ergenekon is Our Reality” challenges the opponents of the Ergenekon case. “Ergenekon is Our Reality” is the final report of a workshop that was held on April 10-11 2010 in Istanbul with the initiation of the Young Civilians and the Human Rights Agenda Association. The report was introduced to the press on the 1st of July, 2010. Attending the press conference in the Ottoman Legacy Hotel, foreign press members directed their questions to Orhan Kemal Cengiz and Bekir Berat Özipek, who were involved in putting together the discussions that took place during the workshop, in the form of the report “Ergenekon is Our Reality”. According to Cengiz and Özipek, this report intends to question the vast misinformation related to the Ergenekon case, and introduce the Western press organs with a different view on its importance. Views of the intellectuals, human rights advocates, jurists and civil society representatives who participated in the workshop are presented in the report “Ergenekon is our Reality” under ten different titles, where all the claims put forward by the opponents of the Ergenekon case are discussed thoroughly as “hypotheses”. We are sure that “Ergenekon is Our Reality”, which has reached wide circles in a short time, will continue its success in provoking new debates in the public space where the mindset and arguments of the opponents of the Ergenekon case once prevailed. from various points along the political spectrum — who are better known for their perspective of non-discriminative human rights and sensitivity to democracy –sought answers to the claims. No matter whether they were put forward as a result of misinformation or if they are intended to protect the right of Ergenekon suspects to a fair trial, all main claims were individually discussed, independent of the persons who put them forward. Nearly 50 participants of the workshop responded to claims frequently expressed by opponents of the Ergenekon case and investigation. The findings of the paper were enriched with the views of esteemed human rights advocates and intellectuals, who unfortunately were not in attendance at the workshop. We owe thanks to everyone whose names are included in the Workshop Participants and Contributors list and were victimized or lost their lives on the path of Turkey’s long and bitter adventure to democracy.